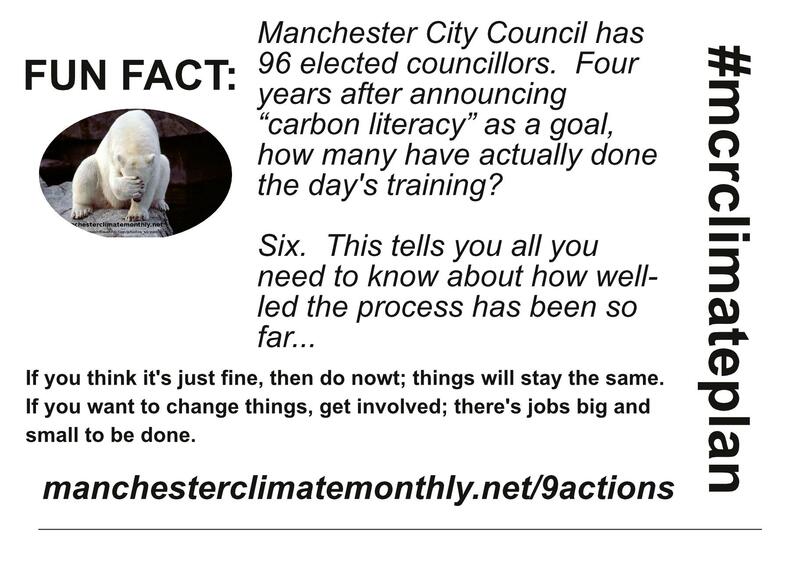 Many of Manchester City Council’ elected members have been thwarted from completing their “carbon literacy” training by the last-minute cancellation of workshops. (one of Higher Blackeley’s three councillors, and chair of the Labour Group), posed a question during a Scrutiny Committee meeting on Tuesday (1). Councillor Lanchbury pointed out that it was “this time last year” that a lot of councillors had done the necessary half-day’s e-learning but that could not become certified as carbon literate because the workshops that would complete the training had been cancelled and simply never re-scheduled. The Executive Member for the Environment, Cllr Kate Chappell (Rusholme), thanked (non-sarcastically!) Cllr Lanchbury for the reminder and stated that the workshops had been poorly attended, that there was a lot of feedback on both the e-learning component and workshops, and that this feedback had needed to be “processed”. There was general agreement that log-in details – and more importantly – carbon-knowledge details had been forgotten and reminders of one/both would need to happen. Cllr Chappell promised that she intended to get the workshops going again quickly. She was not the responsible Executive Member at the time of the events described above – where anything that could go wrong seems to have gone wrong. Cllr Chappell took over the role only in November 2013, following a “reshuffle” of the Executives’ roles and responsibilities. Meanwhile, people who have signed the Open Letter to the Council calling on it to take Nine Actions, will be bewildered that so basic a thing as completing some workshops seems to have been too much of a task for the relevant authorities. While 500 employees of the Council are now “carbon literate”, only 6 Councillors are. Despite this, the plan of ‘action’ tabled at an recent council meeting (the “Environmental Sustainability Subgroup) is for all 96 to have completed their training by … March… 2017. #senseofurgency. (1) This exchange took place during an extraordinary – and perhaps indescribable, though I may try – meeting of the Neighbourhoods Scrutiny Committee, on Tuesday 4th February. This entry was posted in #mcrclimateplan, Climate Change Action Plan, Manchester City Council. Bookmark the permalink.